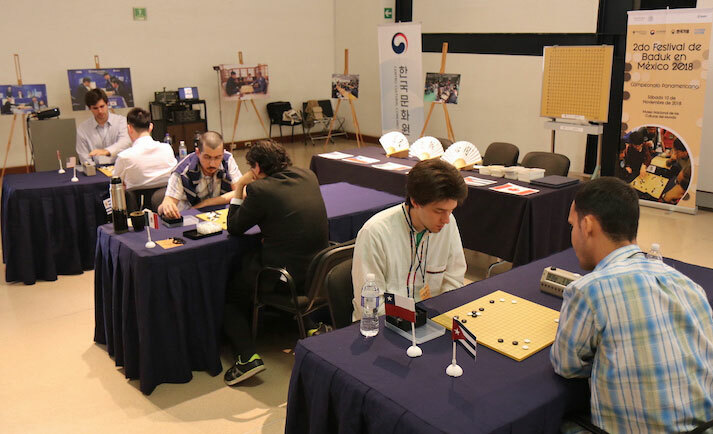 On November 10th, in a short tournament format, great players from the American continent got together in Mexico’s City “Museo de las Culturas” for the 1st ever Pan-American Baduk Championship, hosted and sponsored by the Korean Cultural Center in Mexico City. The fortunate players who got a full paid trip for the event and were competing for a 3000 USD prize bag were: Aaron Ye-USA, Manuel Velasco-Canada, Alfonso Artigue-Uruguay, Orlando Mederos-Cuba and Abner Turkieltaub-Chile. Mexico had its own representative Abraham Florencia playing too. At the same time that the Championship took place, Ryu Soohang 5 dan professional from the Korean Baduk Association gave simul games on 2 rounds against 4 adults and 5 kids on each round. Also many children were playing in friendly games, giving a lively atmosphere to the event. The only undefeated player after 3 rounds ended up to be Aaron Ye claiming so the title for the USA. Manuel Velasco from Canada and Orlando Mederos from Cuba ended up in 2nd and 3rd place respectively. Cuban player Orlando pointed out:” The treatment received by the host has been really good and the museum venue is beautiful. I got chosen for this event out of a top 20 players qualifier played in Habana, Cuba”. We asked Korean Cultural Center organizer Miss. Hyemi Song how did they got interested in promoting go in Mexico and Latin America to which she said: “The son of Mr. Ki Jin Song, director of the Korean Cultural Center is a big fan of baduk, so we searched for a way to spread this culture within Mexico”. 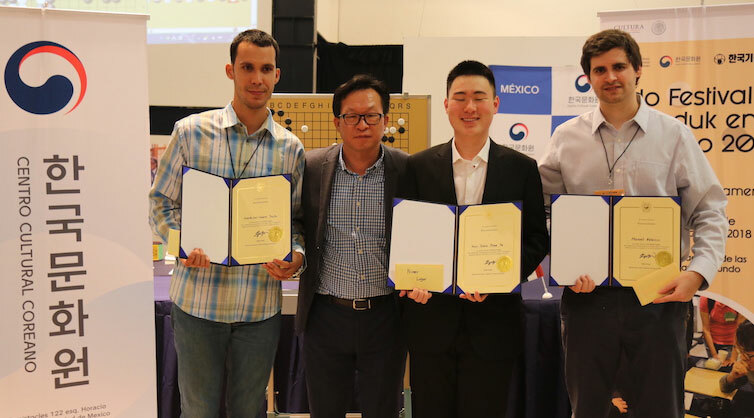 Mexican organizer for the Korean Cultural Center Mr. Siddhartha Avila commented: ”Korea is outstanding in the promotion of go, we are really glad about it.”At the end of the event Mr. Ki Jin Song promised a bigger prize Championship for next year, so we are looking forward to it. Read Korea’s Cultural Center report on the event here.